Headed by our fearless leader, Cellar Master Jeff Katz, we are proud to present the cast of characters that make up our 2016 Harvest Intern program at The Carlton Winemakers Studio. Casey is returning to the Studio for his 6th harvest. Casey worked last vintage with Kelly Kidneigh at the Studio and has been a semi-regular fixture in the cellar throughout the year. He started out as a home brewer in Bend, Oregon and eventually became interested in agriculture and sustainability. In his heart he wanted to be a farmer but his background in fermentation science led him in the direction of winemaking and viticulture. He interned in Sonoma, California at Roth Estate, a winery which produces Bordeaux-style wines from Alexander Valley and cool-climate wines from the Sonoma Coast. He also did a vintage in Central Otago, NZ at the famed Mt. Edwards Winery, an historic winery founded by Alan Brady—a pioneer in New Zealand Pinot noir—and now headed by Duncan Forsythe. A stint in Victoria, Australia at Lethbridge Wines rounded out his international practical training. 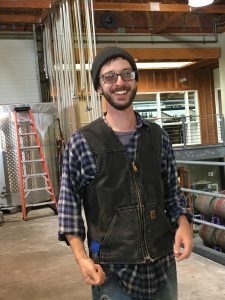 Casey is actively working toward his own dream of propelling his brand Cascadia Wine Collective, a project started in the 2015 vintage with his 3 friends. Cascadia Wine Collective is a concept brand where the group makes two different wines each vintage utilizing fruit from all of Cascadia which includes Washington, Oregon, Northern California and Idaho. In 2015, CWC crafted a Riesling and Pinot noir, 2016 harvest plans are for a Washington Malbec and an Oregon Gouge clone of Pinot blanc from Eola-Amity. Using interesting and variable varietal choices, Cascadia hopes to hone their style without limiting themselves to the Willamette Valley. 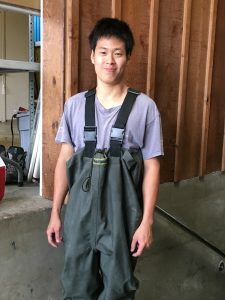 Casey dreams of an “off grid” sustainable food-production farm based around a vineyard utilizing his experience as a certified permaculture designer. It seems he is getting ever closer to achieving his dreams and keeping things interesting. Jadmika is coming to the Studio to do his 9th harvest. This Kiwi began his journey as a child on a trip to Europe with his family. He became interested in wine and the science of winemaking. Although his parents didn’t drink and questioned his obsession, he started in the wine industry at 17 years old. He spent several years in Hawks Bay, NZ working for Pask Winery. One of the most established wineries on the East coast of the North Island since 1985, Pask specializes in Bordeaux-style wines and has been instrumental in establishing the famed Gimblett Gravels district in Hawks Bay. From there he spent time at Kunde Family Winery in Sonoma, a 100% Estate-grown, 5 generation winery with a heavy emphasis on terroir and history. Again, at Kunde, he helped to craft Bordeaux-style wines with a sense of place. Jadmika came to Oregon to learn about Pinot noir. He has always had a love and interest in meeting new people and travel but kept coming back to his love of winemaking and his curiosity specifically with wines during post maceration. “Jad” is here to learn but also coax his dreams of one day having his own brand. The journey is as important as the destination, perhaps the journey is the destination for Jadmika. Ben is a seasoned intern at the Studio. 2016 will mark his 8th Harvest. After several other forays into various aspects of the wine business, Ben has travelled a bit to reach a better understanding of winemaking and the many nuances of the craft. It is travel, after all, that attracted him to the wine business in the first place. Harvests in Marlborough, New Zealand at Spy Valley Winery and Weingut Rudolph Furst in Burgstadt in central Germany (where he cut his chops on Pinot noir and produced, by Ben’s estimations, the best Pinot he’s ever produced) created a passion for wine production and an understanding of fermentation that he will never forget. A stint at Brown Brothers in Milawa, Australia allowed him to span his understanding to a multitude of varietals and helped him understand the scope of the wine business. In 2014, he served as an intern for Andrew Rich here at the Studio, where he carried that knowledge forward and onward toward his own dreams. He worked the 2015 harvest at Scott Paul Winery in Carlton. Ben has now set his sights on a future in the Cider business. 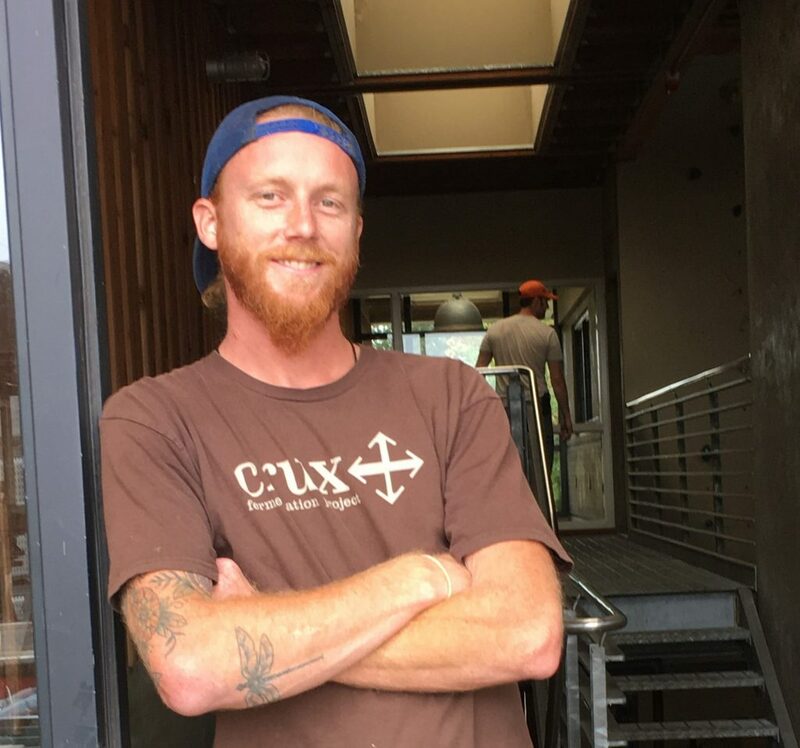 After harvest, Ben plans to move to Portland with his love and is eying a shift toward Cider. We, of course, wish him the best in his new endeavors. Christina is working her very first vintage this fall. A former yoga instructor in Orange County, California, she became disillusioned with the commercialized scene and tapped into her inner traveler. Spending time in various and numerous locations, it was a chance encounter in Baja, Mexico that lead her to the Willamette Valley. She has a masters degree in Sustainable Development Studies that she received in Perth Australia. It was in part because of this that she found herself here in the Willamette Valley. 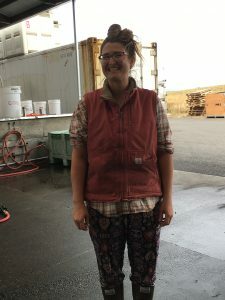 Christina was curious about the sustainability of the wine industry in Oregon and was happily surprised to find a need for interns in that very industry. She is a rock that gathers no moss. Her plans are set for her travels after harvest. She will spend time back in Orange County with her sister for the holidays, a brief stint in Florida and then Hawaii, but then her next big adventure in India begins at an Orphanage which is self-sustaining. Christina is very interested in this model and hopes to absorb the intricate functionalities for future use in her life path to support socially and environmentally conscious utilization of resources. Christina’s journeys are epic and varied. Her skills entail the highly scientific to the spiritual. She has an understanding of the physical and the philosophical and this is why she will add so much to our intern winemaking program at The Carlton Winemakers Studio. Not all who wander are lost. Meeting our Cellar Master, Jeff Katz, last year got Steve thinking about a career change. Growing up in Bozeman Montana, Steve already had a career in the wine industry working for a wine distributor—Cardinal Distributing—where he sold wines from all over the world. It was working with an Oregon Pinot noir producer, Anne Amie that piqued his curiosity with the Willamette Valley and its focus on the thin-skinned grape which ultimately nudged him to make a move from his beautiful mountain home town. Steve’s interest and passion for wine started when he got his first level Sommelier certification while working for Emerson Grille, an upscale wine-focused restaurant in Bozeman. Steve took his excitement and turned it into initiative. It’s this kind of ambition that is propelling Steve closer to his vision. Working his first vintage ever in the wine industry, Steve has set his sights on a dream of planting and farming a vineyard in Las Cruces, New Mexico. As he starts the hard work of harvest, we can’t help but admire the effort and dedication he shows toward his future. Steve is not only dreaming of his future, he is creating it. His enthusiasm and hard work will make him a fantastic intern at the Studio. 2016 will be Chase’s 6th Vintage in the wine business. 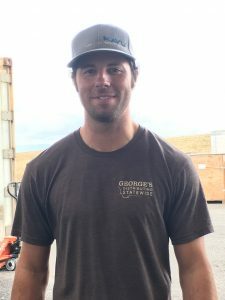 Having a couple of harvests in Australia, a stint at Vinify, a custom crush facility in Santa Rosa, California and an internship at Dobbs Family Estates in Dundee, Oregon under his belt, Chase is excited to be working with Andrew Rich Wines this harvest at the Carlton Winemakers Studio. 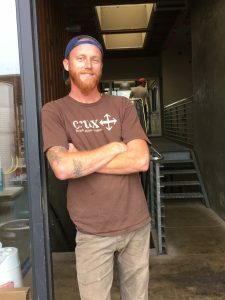 Part of the Cascadia Wine Collective, a group of friends from Bend who are creating a wine brand by the same name, Chase is focused on expanding and nurturing his project with an emphasis on growing his own grapes sometime in the future. The Studio welcomes Chase and his ambition as well as his knowledge and work ethic. Lucky for the Carlton Winemakers Studio, Merek loves Pinot noir. 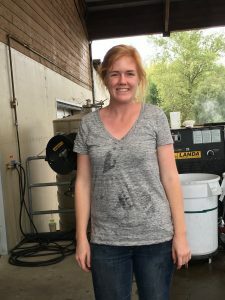 It’s why she is in Oregon and we are thrilled to have her and her passion this harvest as she interns for Isabelle Meunier of Lavinea Wines. Merek brings a degree in Eonology from UC Davis and has shifted her practical work experience thus far between the lab and the cellar. This will be Merek’s 9th Harvest and second in Oregon, having worked last year on the premiere vintage at Domaine Roy et fils in Dundee. Merek enjoyed the challenge of being a part of the very beginning of a project and helping to create systems for an operating winery. But that is not the beginning of her journey at all. After UC Davis, Merek did her very first vintage in Napa at Artesa Winery, an impressive and beautiful winery and vineyard at the heart of California wine country. Vintages in Australia, Germany and Chile led to an amazing experience in South Africa with Stellar Organic making almost every varietal one could imagine. Merek dreams of making her own wine one day and we can’t wait to see that happen. Until then, she will be moving to Germany after harvest to get her masters degree in Organic Agriculture in Stuttgart at Hohenheim. Like a rocket, Merek is rising to the stars and we couldn’t be happier to enjoy her work with The Studio this 2016 vintage.